In the tests described next, scores are statistically compared to large databases of people with no mental health disorders or history of head injuries. The tests have been published and validated in peer reviewed scientific journals and are suitable for use in diagnostic systems. Together they can provide convergent evidence of an organic basis for a post-concussion syndrome, which requires specialised treatment with Neurotherapy  and appropriate nutrients to repair damaged tissues. QEEG is the statistical evaluation of the electrical activity of the brain. The QEEGs of hundreds of typically functioning people with no mental health issues or history of head injuries make up the normative database against which the QEEG of patients are compared. 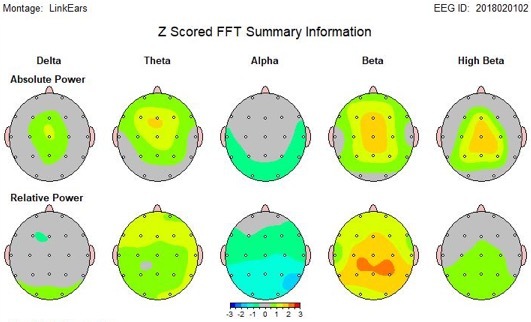 The differences are expressed as Z scores (standardised deviations from th mean). QEEG is particularly suitable for the evaluation of post-concussion syndrome, as it is empirical, objective, non-intrusive and has been shown to be highly accurate in identifying and discriminating various neurophysiological patterns of brain dysfunction associated with Minor TBI and post-concussion syndrome [33-35]. A 2004 review of the scientific literature by Dr. Jacques Duff, published in the journal of the EEG and Clinical Neuroscience Society suggests that QEEG is superior to structural Neuroimaging techniques in detecting brain dysfunction related to Minor TBI and post-concussion syndrome  which can occur with or without loss of consciousness. There are in excess of 40,000 QEEG papers published since 1990, and there are no concerns in these papers about false negatives from QEEG Discriminant Functions. The only negatively critical paper about the clinical uses of QEEG was published in 1997 by Newer from the Academy of Neurology. The opinions expressed in that paper were refuted and discredited by the EEG and Clinical Neuroscience Society  as they were shown to be based solely on innuendo and vague unsupported statements, without a comprehensive review of the extensive literature. Since then, the QEEG Neuroguide system used in the diagnosis of Post-concussion Syndrome has been approved by the US Food and Drug Administration (FDA) on the basis of its efficacy. 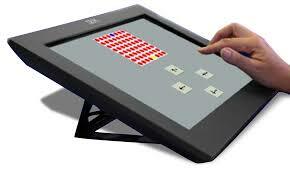 IntegNeuro is a comprehensive Neuropsychological test battery developed by the Brain Resource Company. It is an easy to use, fully automated and computer administered series of 14 separate neuropsychological cognitive tests (tests of mental functioning) that reflect an individual’s cognitive performance profile. The test battery draws on the Brain Resource International Database, which consists of over 1000 normal individuals who have undergone a complete neurophysiological and neuropsychological battery of tests . IntegNeuro is used to establish the degree of cognitive impairment due to stroke, head injuries and dementias, and to evaluate treatment progress. Instructions for each subtest are administered through headphones, and the system's touchscreen is used for providing answers by the person being examined. There is a high degree of standardisation as there is no human judgement by the administering Psychologist, whose role is limited to monitoring the test. A review paper in the October 2004 issue of Clinical EEG and Neuroscience concluded that QEEG was the most sensitive Neuroimaging tool for the assessment of post-concussion syndrome and that Neurotherapy had been shown to be the most promising treatment to date for post-concussion syndrome . Medication may provide temporary relief from pain and counselling may help some persons understand the need to control their impulses and anger. However, there is no evidence in the literature that medication or cognitive rehabilitation can effectively restore the cognitive deficits or concentration in post-concussion syndrome. People with attention deficits and MTBI tend to have an excess of slow-wave brain electrical activity and coherence abnormalities. Neurotherapy (EEG biofeedback) uses operant conditioning of the EEG to give patients audio/visual rewards for producing more normal patterns of brainwave activity. Since the 1970s studies have shown that, through Neurotherapy, patients can be taught to promote normal functioning in the brain by normalising dysfunctional brainwave patterns [33, 38-41]. A more recent improvement in Neurotherapy is in the use of QEEG to identify the specific brainwave patterns that need to be redressed [42-44]. Neurotherapy can also be used for improved mood and concentration and enhancement of mental performance in persons with post-concussion syndrome. Look up the major review of the literature published in October 2004 in Clinical Electroencephalography, a peer reviewed medical journal. Thatcher, R.W., EEG operant conditioning (biofeedback) and traumatic brain injury. Clin Electroencephalography, 2000. 31(1): p. 38-44. Hugenholtz, H., et al., How long does it take to recover from a mild concussion? Neurosurgery, 1988. 22(5): p. 853-8. Slagle, D.A., Psychiatric disorders following closed head injury: an overview of biopsychosocial factors in their etiology and management. Int J Psychiatry Med, 1990. 20(1): p. 1-35. Fenton, G.W., The postconcussional syndrome reappraised. Clin Electroencephalogr, 1996. 27(4): p. 174-82. Ponsford, J. and G. Kinsella, Attentional deficits following closed-head injury. J Clin Exp Neuropsychol, 1992. 14(5): p. 822-38. Ponsford, J., S. Sloan, and P. Snow, Traumatic Brain Injury: Rehabilitation for everyday adaptive living. 1995, Hillsdale (USA): Lawrence Erlbaum Associates. Zwil, A.S., M.E. Sandel, and E. Kim, Organic and psychological sequelae of traumatic brain injury: the postconcussional syndrome in clinical practice. New Dir Ment Health Serv, 1993(57): p. 109-15. Stevens, M.M., Post concussion syndrome. J Neurosurg Nurs, 1982. 14(5): p. 239-44. Elkind, A.H., Headache and facial pain associated with head injury. Otolaryngol Clin North Am, 1989. 22(6): p. 1251-71. Fann, J.R., et al., Psychiatric disorders and functional disability in outpatients with traumatic brain injuries. Am J Psychiatry, 1995. 152(10): p. 1493-9. Munoz-Cespedes, J.M., et al., [The nature, diagnosis and treatment of post-concussion syndrome]. Rev Neurol, 1998. 27(159): p. 844-53. Pelczar, M. and B. Politynska, [Pathogenesis and psychosocial consequences of post-concussion syndrome]. Neurol Neurochir Pol, 1997. 31(5): p. 989-98. Harrington, D.E., et al., Current perceptions of rehabilitation professionals towards mild traumatic brain injury. Arch Phys Med Rehabil, 1993. 74(6): p. 579-86. Binder, L.M., Persisting symptoms after mild head injury: a review of the postconcussive syndrome. J Clin Exp Neuropsychol, 1986. 8(4): p. 323-46. Hilton, G., Behavioral and cognitive sequelae of head trauma. Orthop Nurs, 1994. 13(4): p. 25-32. Hillier, S.L., M.H. Sharpe, and J. Metzer, Outcomes 5 years post-traumatic brain injury (with further reference to neurophysical impairment and disability). Brain Inj, 1997. 11(9): p. 661-75. Millis, S.R., et al., Long-term neuropsychological outcome after traumatic brain injury. J Head Trauma Rehabil, 2001. 16(4): p. 343-55. Hillier, S.L. and J. Metzer, Awareness and perceptions of outcomes after traumatic brain injury. Brain Inj, 1997. 11(7): p. 525-36. Johansson, E., M. Ronnkvist, and A.R. Fugl-Meyer, Traumatic brain injury in northern Sweden. Incidence and prevalence of long-standing impairments and disabilities. Scand J Rehabil Med, 1991. 23(4): p. 179-85. Malia, K., G. Powell, and S. Torode, Personality and psychosocial function after brain injury. Brain Inj, 1995. 9(7): p. 697-712. Max, J.E., B.A. Robertson, and A.E. Lansing, The phenomenology of personality change due to traumatic brain injury in children and adolescents. J Neuropsychiatry Clin Neurosci, 2001. 13(2): p. 161-70. Gerring, J., et al., Neuroimaging variables related to development of Secondary Attention Deficit Hyperactivity Disorder after closed head injury in children and adolescents. Brain Inj, 2000. 14(3): p. 205-18. Voller, B., et al., Neuropsychological, MRI and EEG findings after very mild traumatic brain injury. Brain Inj, 1999. 13(10): p. 821-7. Jansen, H.M., et al., Cobalt-55 positron emission tomography in traumatic brain injury: a pilot study. J Neurol Neurosurg Psychiatry, 1996. 60(2): p. 221-4. Rudolf, J., et al., Cerebral glucose metabolism in acute and persistent vegetative state. J Neurosurg Anesthesiol, 1999. 11(1): p. 17-24. Bergsneider, M., et al., Cerebral hyperglycolysis following severe traumatic brain injury in humans: a positron emission tomography study. J Neurosurg, 1997. 86(2): p. 241-51. Matz, P.G. and L. Pitts, Monitoring in traumatic brain injury. Clin Neurosurg, 1997. 44: p. 267-94. Thatcher, R.W., et al., Biophysical Linkage between MRI and EEG Amplitude in Closed Head Injury. Neuroimage, 1998. 7(4): p. 352-367. Thatcher, R.W., et al., Biophysical linkage between MRI and EEG coherence in closed head injury. Neuroimage, 1998. 8(4): p. 307-26. Thatcher, R.W., et al., Quantitative MRI of the gray-white matter distribution in traumatic brain injury. J Neurotrauma, 1997. 14(1): p. 1-14. Shaw, N.A., The neurophysiology of concussion. Prog Neurobiol, 2002. 67(4): p. 281-344. Montgomery, E.A., et al., The psychobiology of minor head injury. Psychol Med, 1991. 21(2): p. 375-84. Duff, J., The usefulness of Quantitative EEG (QEEG) and Neurotherapy in the Assessment, and Treatment of Post-Concussion Syndrome. Clinical EEG and Neuroscience, 2004. 35(4): p. 1-12. Hughes, J.R. and E.R. 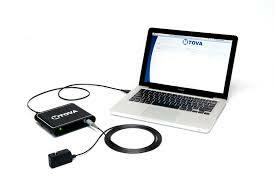 John, Conventional and quantitative electroencephalography in psychiatry. Journal of Neuropsychiatry and Clinical Neurosciences, 1999. 11(2): p. 190-208. 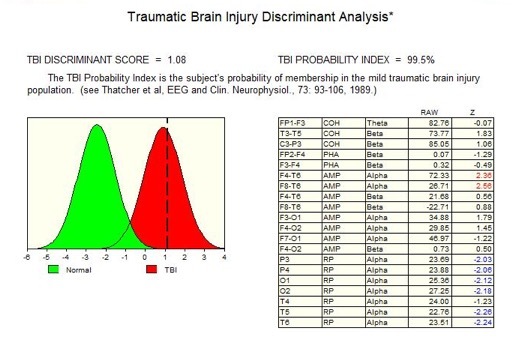 Thatcher, R.W., et al., EEG discriminant analyses of mild head trauma. Electroencephalogr Clin Neurophysiol, 1989. 73(2): p. 94-106. Thatcher, R.W., et al., QEEG and traumatic brain injury: rebuttal of the American Academy of Neurology 1997 report by the EEG and Clinical Neuroscience Society. Clin Electroencephalogr, 1999. 30(3): p. 94-8. Gordon, E., Integrative neuroscience in psychiatry: the role of a standardized database. Australasian Psychiatry, 2003. 11(2): p. 156-163. Lubar, J.F., Discourse on the development of EEG diagnostics and biofeedback for attention-deficit/hyperactivity disorders. Biofeedback and Self Regulation, 1991. 16(3): p. 201-225. Sterman, M.B., Sensorimotor EEG operant conditioning: Experimental and clinical effects. Pavlovian Journal of Biological Science, 1977. 12(2): p. 63-92. Sterman, M.B., EEG biofeedback: physiological behavior modification. Neurosci Biobehav Rev, 1981. 5(3): p. 405-12. Thompson, L. and M. Thompson, Neurofeedback combined with training in metacognitive strategies: Effectiveness in students with ADD. Applied Psychophysiology and Biofeedback, 1998. 23(4): p. 243-263. Thatcher, R.W., Normative EEG databases and EEG biofeedback. Journal of Neurotherapy, 1998. 2(4): p. 8-39. Thatcher, R.W., EEG database guided neurotherapy, in Introduction to Quantitative EEG and Neurofeedback, A. Abarbanel, Editor. 1999, Academic Press: San Diego. Sterman, M.B., Physiological origins and functional correlates of EEG rhythmic activities: Implications for self-regulation. Biofeedback and Self Regulation, 1996. 21(1): p. 3-33.